I'm not really a salad eating type of person, but if I do have to get a salad I usually get caesar. When I saw these chicken caesar sandwiches of pinterest, onto the monthly menu they went. 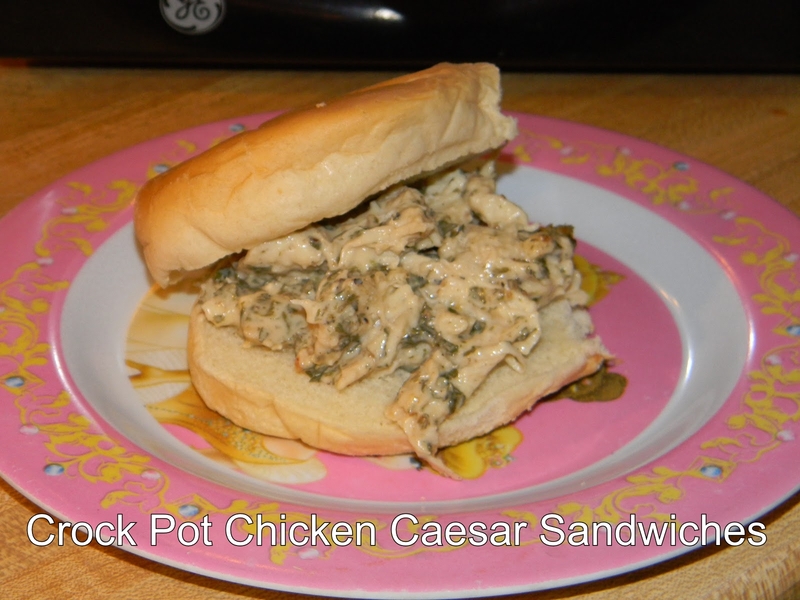 Place chicken and water in crock pot. Cover and cook on low 4-6 hours. Remove chicken and discard water. Shred chicken then return to crock pot. Mix in dressing, pepper and parsley. Serve on buns. You can also put some lettuce on it. These were pretty good. I think I used to much dressing though as they were really caesary (yes, that's a word) I used 1 cup so next time I think I'll just go with a half cup. And also I used 1/4 cup dried parsley, but the original recipe says only to use that much if you're using fresh chopped. I really need to pay more attention while cooking, but with two kids running and crawling around sometimes I get distracted.